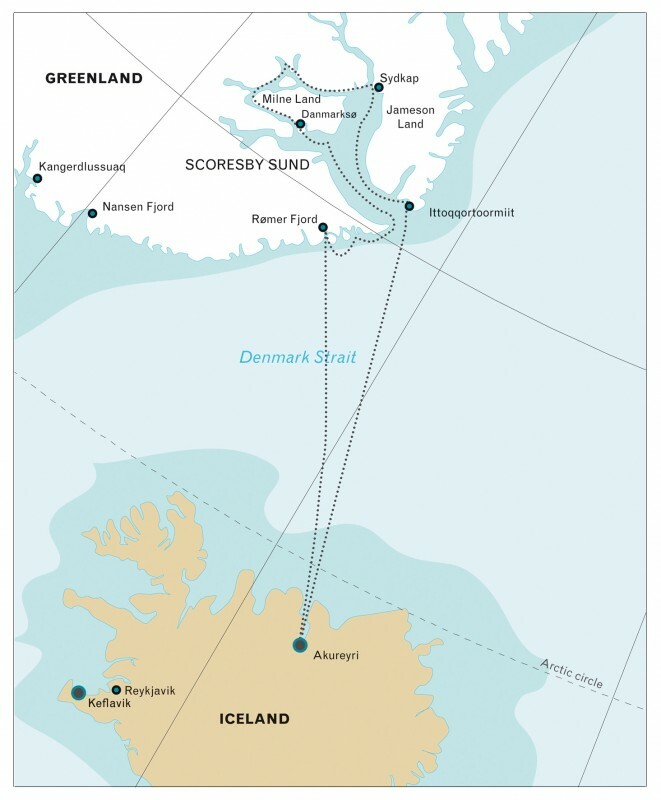 Longyearbyen - Myggebugten - Blomster Bugt - Scoresbysund - Cape Hofmann Halvø - Ittoqqortoormiut - Akureyri - Reykjavik. Visiting Greenlandic Inuit communities and their culture. Countless fjords, snow capped mountains, late summer icebergs, glaciers. 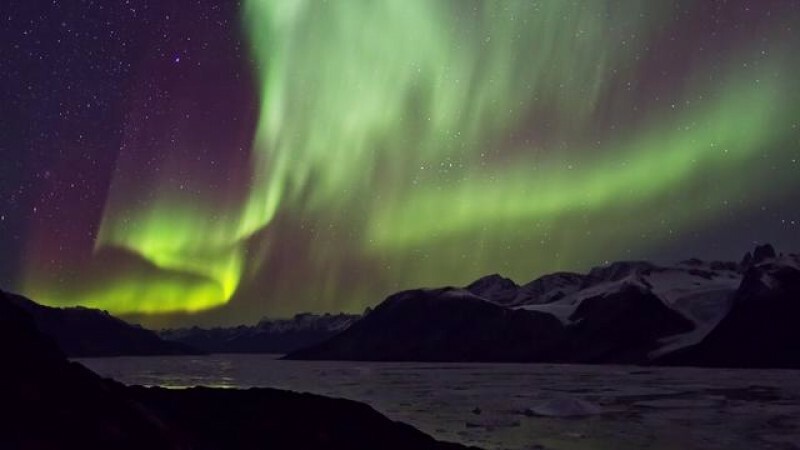 Possible sightings of Aurora borealis during sea crossings. Birds: Kittiwake, fulmar, arctic tern, eider, diver, barnacle & brent geese and more. Terrestrial mammals: Arctic Fox, Lemming, Reindeer, Black Bear. Whales: Humpback, Fin, Minke, Orca, Blue, Pilot, Bowhead, Dolphins. Seals: Hooded, Harp, Bearded, Ringed. Approaching Greenland we will attempt to sail through the sea ice into Foster Bugt, making our first landing at Myggebugten. Beyond the old hunters' hut (in the first half of last century Norwegian trappers hunted here for Polar Bear and Arctic Fox) there is an extensive tundra populated by Musk Oxen. The small lakes are home to geese. We sail through Kaiser Franz Joseph Fjord, a magnificent fjord with towering mountains on both sides, its inner reaches choked with huge icebergs. An alternative is Sofia Sund, which is much narrower. We will land at Blomster Bugt to view the beautiful geological formations. Arctic Hare are usually seen here, and there is a lake with Great Northern Diver and their young. In the afternoon we sail along Teufelschloss and Ella Ø and may land at a beautiful spot in the early evening. Today we reach the Scoresby Sund and sail in the morning along the ragged and glaciated Volquart Boons Kyst. Here we may organise a zodiac cruise along one of the glacier fronts of this coast, and have our first landing near for instance Måne Glacier. Later we land on Danmark,Ø where we find the remains of an Inuit settlement abandoned around 200 years ago. The circular ‘tent rings' of stones indicate the summer houses, while the winter houses can be seen closer to a small cape. The sites are well preserved, allowing entrances and even bear-proof meat caches to be identified. There are also grave sites. 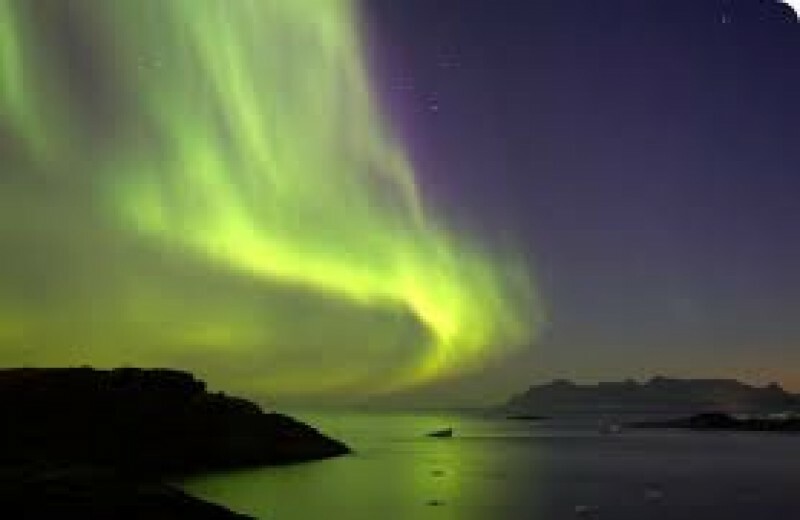 In the evening we continue our sailing through the beautiful fjords to the west, choked with icebergs. 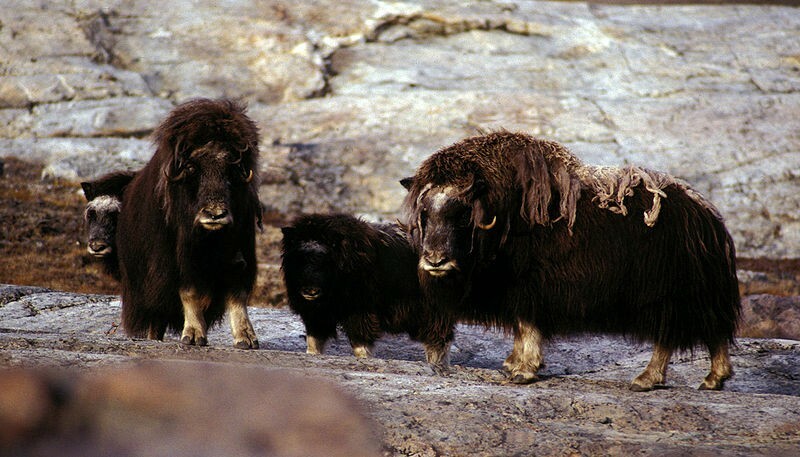 We go ashore at Cape Hofmann Halvø, a reliable spot for viewing Musk Oxen. 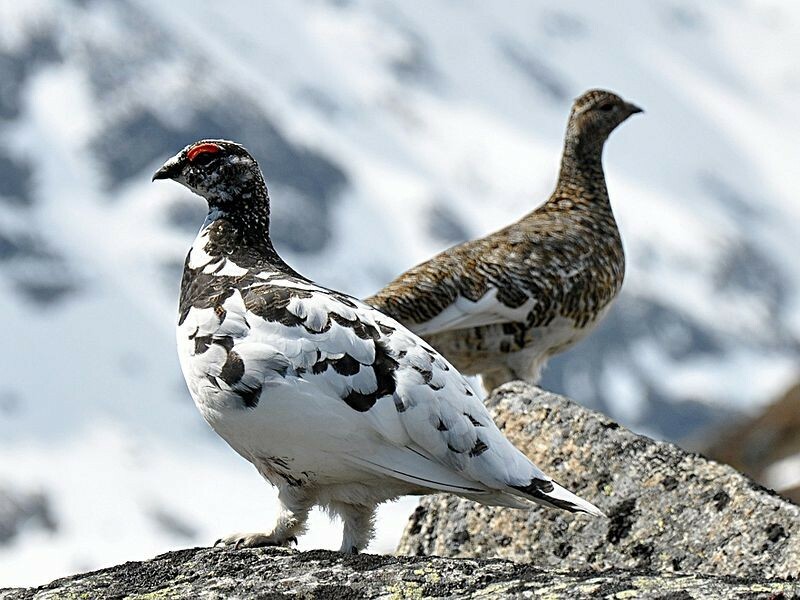 We may also spot Rock Ptarmigan and Great Northern Diver at sea. The landscape here is particularly beautiful, especially during autumn when the Dwarf Willow and Dwarf Birch change colour. Arctic Blueberry and Crowberry add their own colourful touch - the berries are tasty too! In the evening we sail through the fjord towards Scoresby Land, enjoying the contrast between the warm autumnal colours of the vegetation on shore, backed by huge dark mountains, and the cold blue of the icebergs. In Northwest fjord in Scoresby Land in the morning, we encounter huge icebergs, some over 100m high and more than a kilometre in length. Most of the bergs are grounded as the fjord is only about 400m deep here. We land near Sydkap to view the remains of the Thule culture winter houses. As many as 20 people lived in these tiny houses, hunting Greenland Whale and using their vertebrae to build the houses. We may also land at Gurreholm on Jameson Land. The landscape here is gently undulating. In the morning we land at Ittoqqortoormiut, the biggest settlement in the Scoresby Sund with about 500 inhabitants. At the post office you can buy stamps for your postcards, or just wander around to see the sledge dogs and the drying skins of Seal, Musk Ox and Polar Bear. After dinner we will sail south passing the amazing landscape of the Blosseville Coast. In the morning we arrive in Akureyri and are taken by a chartered bus during a 6 hours' drive through North Iceland to our hotels in Reykjavik.